Although it's easy to dismiss 3D as a gimmick that might disappear in a couple of years, there's no denying its current popularity. As a result, we've seen plenty of 3D-compatible laptops in recent times, such as Sony's ridiculously enormous VAIO F-Series and the HP Envy 17 3D. Some 3D laptops were heavier than a baby elephant, while some of the earlier models made us so nauseous that we almost threw up and passed out. One of the best reasons to buy an Nvidia 3D Vision laptop is the huge variety of supported games. All of the AAA titles such as Battlefield, Portal and Fifa now come 3D-ready, and we have to admit that the extra dimension really does immerse you in the game. There's nothing like squinting down the barrel of a shotgun as a screaming Nazi hurtles out of the screen at you. 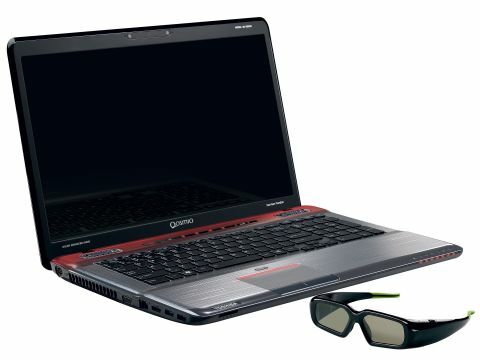 Toshiba's Qosmio X770-107 is clearly intended for 3D gaming, with its red-and-black rough-edge design. Thankfully it's a lot more subtle than the likes of Alienware's laptops, with their glowing headlights and angular spacecraft bodies, and it's also a bit lighter than most gaming laptops. However, the bulky 3.7kg body is still best left on a desk at home. Only Captain America would use this as an everyday travel companion. The Toshiba Qosmio X770-107's chassis is reasonably solid, although the palm rests and edges do flex under pressure. The keyboard is thankfully a lot firmer, with its keys separated out in the popular isolation-style design. You're less likely to bash the wrong key during frantic action games, and it's also a great board to touch-type on. We especially liked the subtle red backlighting, for those late-night gaming sessions. Above the keyboard is a row of media shortcut keys. These can be used to adjust the volume, play and pause your media, and of course turn the 3D graphics on and off.